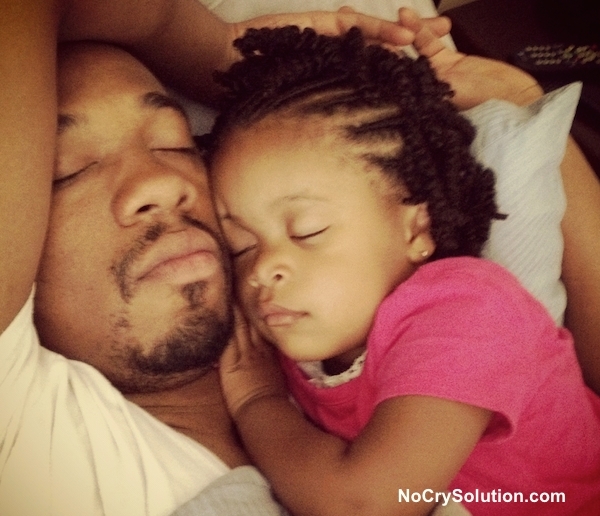 Do you have to stay with your child until she falls asleep? If you do stay in the room until your child is asleep you're not alone – as a matter of fact, you are in the majority – as more than half of parents, follow this routine. Most importantly, this tells us that this “problem” isn’t really a “problem” at all, but normal childhood behavior. You represent security, safety, and love. Falling asleep brings the vast unknown. If a big, strong parent is in the room, then all is well, and a child can relax enough to sleep. The dark brings frightening shadows. The quiet invites mysterious noises. The stillness brings scary thoughts. A parent in the bed, or beside the bed, is the ultimate protection from all things scary. When the activity of the day grinds to a halt, your child’s unoccupied mind begins to sort through the day’s events. Worries enter your child’s thoughts – things that have happened, “Oh, no! Where did I put my red truck?”, and worries about upcoming events, “Did Daddy say we have to go to the doctor’s tomorrow?” Preschoolers worry about bigger things – “Will my dog run away?” “Will our house burn down?” “Will Mommy or Daddy die?” These worries loom large when a child is alone in the quiet and dark. Having a parent nearby is the ultimate protection against scary thoughts. If you put your child to bed when he’s not tired – or overtired – he won’t willingly stay put. He’s wide awake and would rather be doing anything else than lying in bed, so your company is the only thing that keeps him there. This means that almost 90 percent of breastfeeding toddlers fall asleep nursing at least once a week and almost 70% do this almost every night! Let me repeat that amazing information for you: Almost 90 percent of breastfeeding toddlers fall asleep nursing. The sucking-to-sleep association is the most difficult and complex sleep association to change, and so this – obviously! – becomes a key component to your child needing you with her as she falls asleep. Your child wants Mommy – and nobody but Mommy will do! No matter how wonderful and loving that Daddy, your partner, the baby-sitter, or Grandma are, nature and biology take a role in causing your little one to prefer Mommy above everyone and everything else in the world. Especially when it comes to bedtime! And while we may instinctively understand this, it can be a challenge when Mommy is also dealing with younger or older siblings, or when she’s just all Mommied out from a long day of child-tending. When it comes to bedtime, many mothers have conflicting emotions: they want to be a loving, comforting mother, but they also just want a moment – just one! – to themselves. This conflict can be conveyed to your child through both your conscious and unconscious acts and words. If your loving partner offers to take over the bedtime routine your child inevitable rebels with tears or tantrums, it hurts everyone’s feelings, and complicates the already stressful evening, dragging on an already too-long process. We’ve talked a lot about bedtime routines and how critical they are to a peaceful process, and believe it or not, you are demonstrating just how powerful these rituals are. You have a bedtime routine now—and it involves staying with your child until she is asleep. Remember that it takes about a month for a new routine to be formed. Whether you’ve been staying with your child until sleep from the day she was born, or you started doing it after her sibling was born three months ago, or after your move six weeks ago, you’ve likely been reinforcing this routine – night after night – for a long, long time. It will take patience and a plan to create a new routine. What is it that bothers you? Before we proceed with the solutions, take some time to figure out what it is that bothers you about having to stay with your child until the sandman arrives. When you can understand your own feelings, it will help you choose the correct plan of action to take as you make begin to make changes to your current bedtime practices. Need more tips? The No-Cry Sleep Solution Enhanced eBook features a video at the end of each of 14 chapters to help you as you work through the book. You'll have restful nights in no time!